Signs are pointing to a worse-than-usual flu season this year and it’s too soon to tell whether the shot will be effective in preventing infection, experts say. 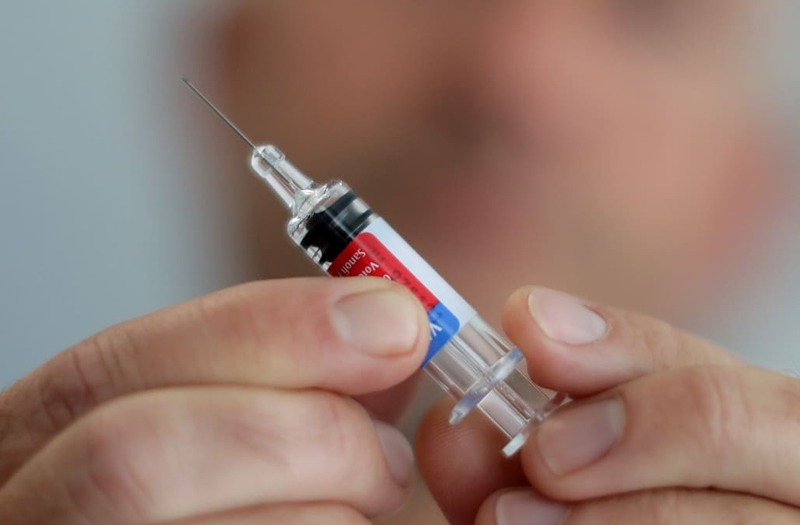 This year, the World Health Organization recommended that the Northern Hemisphere vaccines contain the same strains as those which were used during flu season in the Southern Hemisphere. While this strategy sometimes works, it's possible the vaccine will end up being the wrong match for the virus that dominates in the United States. “Australia, where flu season just ended, saw very high levels of influenza activity this year,” according to Nicole Bouvier, MD, associate professor of Infectious Diseases at the Icahn School of Medicine at Mount Sinai. Preliminary estimates of vaccine effectiveness were low — overall 33 percent effective in preventing influenza and only 16 percent in preventing hospitalization with influenza. “Those two things together suggest that our flu season may be worse than usual and/or the vaccine may be less effective than usual,” she said. This shouldn't be a surprise: the ultimate clear liquid, water is the truest drink to keep you hydrated. Don't like the taste? Add a sugar-free flavor packet, like Crystal Light, to your glass to encourage more guzzling. How do you think ice cubes became the 25th most searched recipe in America, after all? Ice pops, or ice cubes if your freezer just happens to be void of summer’s best treat, are two of the best defenses against dehydration. WebMD advises to look for ice pops made with 100 percent fruit juices to get a 2-in-1 fight against the flu – hydration, plus vitamins. Mother Nature Network notes one Harvard study that shows black tea as the ultimate immunity booster. Drinking five cups of black tea per day for two weeks nearly quadrupled a person’s immunity system – so if tea isn’t a part of your diet already, you germaphobes, you should get on it. Thanks to black tea’s abundance of theanine, flavonoids (antioxidant-like compounds), catechins (compounds that fight free radicals in the body), it’s been proven to fight off the flu. Chicken broth may be your best remedy against a cold and the flu. Vitamins and protein? Check. Hydration power? Check. Anti-inflammatory properties? Check. Congestion-fighting properties? Check. The most popular study on chicken broth, from the University of Nebraska, showed that chicken soup helped reduce upper respiratory cold symptoms and helped build up the nose’s protective cilia, hair-like substances in the nose that prevent contagions – like that pesky flu bug – from entering the body. While you may need a few days to feel well enough to eat a hearty chicken soup, the University of Nebraska provides the ultimate chicken noodle soup recipe. A scientifically-backed recipe to feel better? Not even your mom’s homemade soup-made-with-love can top that. Typically, the influenza vaccine takes between six and eight months to produce and approve. This means recommendations for vaccine strains have to be made in February or March for the following influenza season in the Northern Hemisphere and in September in the Southern Hemisphere. By the time data is analyzed from the previous flu season in the Southern Hemisphere, the Northern Hemisphere vaccine is already being administered and it’s too late to change its makeup. “All of this is essentially speculation, albeit evidence-based speculation — the only thing predictable about influenza is its unpredictability,” Bouvier said. So far, the U.S. is mostly being affected by the A(H3N2) strain of influenza - the same as that which impacted Australia. The good news is that most of these viruses have been similar to the vaccine strain, meaning there are reasons to believe this year might not be a complete “vaccine mismatch,” according to Bouvier. Experts say it could be weeks or months until it's clear whether the current vaccine is working well. In the meantime, the Centers for Disease Control (CDC) continue to recommend the public gets vaccinated. This is particularly important for high-risk individuals, including children under age 5, adults over 65 and pregnant women. The National Oceanic and Atmospheric Administration predicted La Nina will potentially emerge this winter season, bringing with it above-average precipitation and below-average cold temperatures. For example, the Rockies would likely be rocked with abundant snowfall, while the Midwest would be plagued with blasts of cold air. Another more wonky model from Atmospheric and Environmental Research predicts that colder temperatures could hit the East Coast if there is a stratospheric polar vortex disruption. Changes in the jet stream have a direct impact on weather patterns, and in the earliest days of December Americans could see a cold front and snow in the Plains and upper Great Lakes. Averaging 44 inches of snow each winter, Boston is known to get slammed with tough weather. This year, NOAA predicts the historic city will see within 10 inches of that average.